It's almost the end of January. Although it's been pretty mild in my part of the world, and by times in the sun today it really did feel like spring, it is still January. So it seemed rather surprising to me when I got a notice from the ordering co-op I belong to that it was time to order my seeds and seed potatoes for spring planting! Wait! I'm not ready! I was still pondering those seeds when I opened my We'Moon 2012 book to today's date. It turns out today marks a Waxing Half Moon phase on our way to a full moon on February 7th. We'Moon reports this Half Moon is in Taurus. Interesting.. maybe those seeds make sense. We'Moon identifies that when the Moon is in Taurus we may feel the need to slow down in order to plant our roots deep. Those born under a Taurus Moon are said to be strong, solid, stable. They have a deep connection to the earth that is reflected in resources enough to share. http://pixiedusthealing.blogspot.com/2011/11/full-moon-in-taurus.html So the Waxing Moon in Taurus seems like a good time to plant your roots deep so that what you grow will be strong, resilient, and stable. The challenge may be to identify what type of energy, projects, people, or dreams you want to build on during this energy opportunity. I guess it's all about seed selection. And although spring, or the Full Moon, can seem a ways away, if you want your dreams to manifest you have to first select the seeds. Perhaps a couple of good things to plant would be Wild Oat and Clematis. They are both Bach Flower essences and they can both be helpful for realizing your dreams. Wild Oat can help you in the seed selection process. If you're feeling pulled in multiple directions and just not sure where you want to place your energy, you may be bouncing around and back and forth between projects. That kind of unfocused attention can leave you feeling dissatisfied and scattered. It can also leave your dreams unfulfilled. The universe has no idea what to bring you! Wild Oat can help you get a clear picture of what you want to do in life. It can help you identify what type of energy you want to draw towards you during this powerful time. Once you've selected your seeds, you still might need some Clematis in order to get those seeds in the ground. In fact, if you're a Clematis type, or have been through a Clematis state or two, I'm willing to bet you have a package or two of seeds in your junk drawer! Clematis types are great dreamers. Round about the end of January they can look out the window and see flowers growing amongst the green grass as butterflies fly about under a warm spring sun. They can dream right past the reality of dirty snow, slush, and frozen horse manure. They have no problem with the dream, but they lack the Taurus sense of grounded roots. A few drops of Clematis can help you take a more lively interest in the world around you. It can help you bring your dreams into reality. 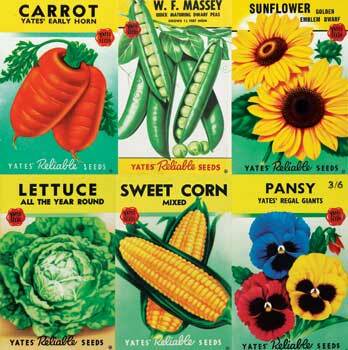 In order to create that flowering garden in the sunshine, you just might have to order some seeds! This Waxing Half Moon in Taurus day is a great time to sit down with the seed catalogue of your mind. Spend a moment or two to really consider what you want to bring into your life. Dream it, scheme it, and consider it from multiple angles. Identify some clear goals and then ride the moon towards it's realization. Bach Lessons From "The Hundred Acre Wood"